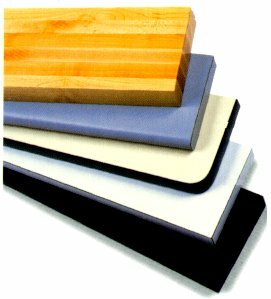 Electra-Tec, Inc. offers a choice of 5 worksurface materials. They are all of the finest quality and are available in a variety of sizes and shapes to meet most applications. Please read the descriptions below for details on each type offered. Standard tops are 30" wide. Standard shelves are 12" wide. Many other sizes are available. Custom lengths are available. HIGH IMPACT LAMINATE: Our most popular work surface is available as standard 1-1/4" thick. The laminate surface is applied to a 45 lb. high density flake board core for exceptional strength and lasting beauty. The underside has a 30 mil laminated backer. This is applied to prevent or retard moisture absorption and, in addition, adds considerable strength to the work surface. Our standard edge treatment is self-edged using the same material as the surface on the edges. Also available are: Vinyl "T" edged where the edge is protected with vinyl which is secured with a barbed protrusion driven into a saw kerf; Bull-nosed where the same material as the surface is drawn over the edge to create a rounded front; Radiused which is basically a self-edged top with rounded corners (on the front two corners). Shelf and backguard construction are typically the same as the worksurface. Backguards attach to the top or shelf with screws and prevent items from sliding off the back of the surface. FIVE COLORS are available for laminate surfaces. The colors are Black, Gray, Smoky White, Almond or Beige (pastel brown). Laminate colors do NOT match metal colors. ESD Worksurfaces: While this looks like high impact laminate, there is a layer of carbon under the surface. When grounding is applied, the carbon dissipates the static charge. FIVE COLORS are available. These colors are Black, Gray, Smoky White, Almond or Beige (pastel brown). ESD top colors do NOT match metal colors. See"Make it ESD" page for more ESD protection options. MAPLE HARDWOOD: These real wood "Butcher Block" tops are standard 1-3/4" thick. Shelves are also 1-3/4" thick, and backguards are 1-1/4" thick. Maple Hardwood makes an extremely strong, durable, non-conductive bench top and if blemished, can generally be refinished on site. Color is the natural finished wood and may vary. EPOXY RESIN: Widely used in laboratory environments, it is resistant to stains and degradation by most harsh chemicals. It resists impact damage, moderate heat (under 350 degrees), is non-porous and a non-conductor. Standard counter top is 1" thick. Backguards are 3/4" thick. Optional surface treatments include marine edged, drain board grooving, sink cutouts, etc. Standard color is black. STAINLESS STEEL: A stainless steel sheet is formed to create a non-porous top with the backguard built-in. These tops can have a phenolic core or hat channels for mounting. Sound deadening is incorporated when using hat channels. Stainless steel is excellent for food preparation and some chemical or wetlab environments. Irregular shapes, sinks and faucets are available. If your application requires special work surfaces, please call us for assistance.